Do you know where your food comes from? Apart from the supermarket or vendor that you buy your food from, do you know who grows this food? Have you had a conversation with the farmer? Not many people know where their food is grown or by whom, or if these farmers live happy lives with enough money to care for their families or if they barely make ends meet. For thousands of years, farmers have been cultivating crops which allowed society to cease gathering plants in order to survive and thus to settle down in one place. For thousands of years, India benefited from the diversity of its land and ecosystems that this vast country has to offer. However, in 1943 the Bengal famine killed 4 million people due to a lack of food. This was caused by external factors that affected the crops and British misuse of resources in India throughout the World War (Dr. Moses, a professor of environmental science). When India gained its independence in 1947, the famine was still fresh in the minds of the politicians, and thus they knew that food security should be one of the priorities for rebuilding India. In addition, globalization brought about a shift in agricultural practices: the green revolution. This shift in agriculture brought a burden to many farmers, this was brought on through financial difficulties or through a sense of isolation from the nuclear family since they were trying to be breadwinners but failed: so many turned to suicide. According to the National Crime Records Buerau, there have been 59,000 farmer suicides over the last 30 years. The reasons for these suicides vary but the impacts are felt in waves, and now the Indian government is trying to implement policies to reduce the suicide rates amongst farmers. 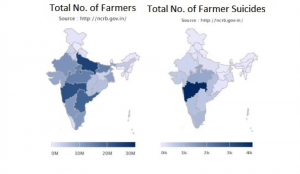 According to Dr. Venkatachalam, an environmental economist at MIDS, 17.1% of India’s Gross Domestic Product (GDP) comes from agriculture, and more than 55% of workers within India are in the agricultural sector. Therefore, agriculture and food security form the bedrock of Indian society and its economy. Since India’s population has been rapidly increasing, the demand for food has also increased. Fortunately, the crop yield has therefore increased to meet this demand, but this increase in supply has caused a decrease in the prices of food and therefore farmers’ profits. Since most farmers in India own small plots of land and are self-sufficient, the price they get for the crops determines their fate, i.e., whether their family earns enough money to sustain themselves. According to Dr. Venkatachalam, the average farmer has a 1.15-hectare plot of land, approximately 2 acres. In addition, most farmers dedicate 30% of their incomes to growing the subsequent season’s crops, so in a year of poor crop yield they receive very little back from their investment. instead of saving them from the previous year from their native plants (Dr. Moses). Many farmers need to take out loans in order to pay for the seeds, since many farmers in India do not qualify for bank loans; therefore, they turn to moneylenders who charge steep interest rates. The farmers frequently are unable to pay back the loans since the cost of the seeds and interest payments for the loan exceed the money they make from selling the crops when there is a bad growing season due to external forces. 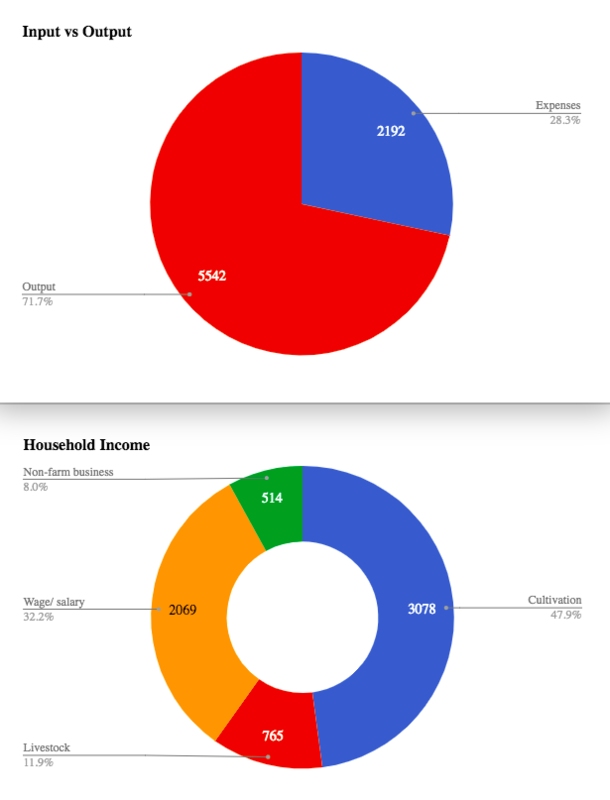 According to the National Sample Survey Office, “over half of all agricultural households are in debt; forty-two percent owe money to banks and twenty-six percent owe moneylenders.” Another detrimental outcome of these high yield seeds is that it severely reduced the diversity of crops grown. This in turn has resulted in less stability in local agricultural systems because negative weather patterns could wipe out an entire season of crops since there are few types of plants being grown. Chemical fertilizers introduced negative impacts on farms as well on the farmers themselves. Constant contact with heavy chemical fertilizers and accidents related to the application of these fertilizers has adversely affected farmers’ health. According to Soil Vasu, the application of chemical fertilizers on the soil could also affect the soil’s fertility level and be another stressor to the crops, thus potentially reducing yield over the medium to long term. These indirect costs related to the usage of chemical fertilizers are not taken into account when determining if chemical fertilizer usage is more beneficial than natural fertilizers. According to Venkatachalam, the suicide number is probably higher than what is stated by the Indian government since suicides, until 2014, where considered to be a criminal offence and therefore weren’t always reported by family members. 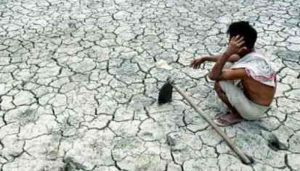 There are many impacts of these suicides to the agricultural industry, mostly in the south of India where most of the suicides occur due to increasing temperatures. For example, if there is a poor harvest then the yield will be lower, but the demand will be just as high, making the prices for food increase. This will increase food insecurity for those under the poverty line. In addition, many jobs in the agricultural sector will be lost, and many people will have to look for jobs outside of this sector. 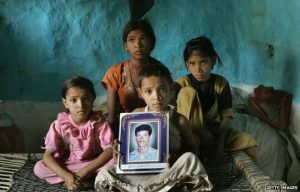 The family of an indian farmer who killed himself. According to the United Nations, many farmers commit suicide by drinking the “very pesticides that no longer work on their crops.” This also has a direct impact on the nuclear families who lost a breadwinner. Farms are usually taken away from the family in order to repay the loan. Widows then become the main breadwinner for the family and children are taken out of school to help on the farm, in the household or somewhere else in order to contribute to feeding the family. According to Carleton, “without interventions that help families adapt to a warmer climate, it’s likely we will see a rising number of lives lost to suicide as climate change worsens in India.” The government has tried implementing relief packages to suicide prone areas of India. The 2006 relief package provided “debt relief to farmers, improved supply of institutional credit, improved irrigation facilities, employed experts and social service personnel to provide farming support services, and introduced subsidiary income opportunities through horticulture, livestock, dairy and fisheries.” In 2008, an agricultural debt waiver and debt relief scheme provided loans to benefit 36 million farmers, costing the government US$10 billion. Apart from this there have also been regional incentives; however, much of this aid has not helped the farmers that are truly in distress. Instead of focusing on income and productivity the government has focused on loans, which many farmers cannot access because they have insufficient funds. By implementing more modern farming techniques, suicide rates could also be reduced. This would include making irrigation equipment and installation more affordable and available, using technology to inform farmers when to plant crops based on weather patterns and weather predictions, and crop insurance, which would provide a safety net for farmers in years with poor crop yields. This is a problem that requires a multi-pronged solution. A healthy agricultural sector is fundamental to India’s long-term social and economic success. Climate change, the green revolution, and globalization have converted farming from what was once an industry that sustained millions of families to one that condemns the marginalized farmers to such abject poverty that some commit suicide. While government has helped some farmers in distress, there are still many whose farming practices are not sustainable. This problem will continue to worsen if the system remains as is. The Indian government, corporations, NGOs and civil society must prioritize the development of solutions for this primordial problem as soon as possible to ensure that India can feed itself, that the number of farmer suicides is reduced and that a diversity of crops is produced to ensure soil health and crop yield in the future. One immediate step we all can take would be to learn about the farmers’ lives who produce our food. Do they suffer from the same challenges as Indian farmers? If so, we can all attempt to be a part of the solution for this Indian and global issue. Venkatachalalam. “Climate Change and India’s Agriculture.” Presentation at Women’s Christina College, Chennai, India. 5 October, 2017. Moses. “Green Revolution.” Presentation at Bishop Heber College, Trichy, Tamil Nadu. 28 October, 2017.